Yeats, who started his artistic era as a Pre-Raphaelite, gained an ultimate reputation when he succeeded. Thanks to Pound in developing rather than unleashing his poetic gifts and approximating the threshold of modernism. Yeats, who was viewed as a survivor of the romantic age, made his poems harsher and more outspoke, adopting an extraordinary directness and a subtle clarity, and striving hardly to represent a new kind of poetry that has the virtues of good prose. Thus, the vagueness as well as the eccentric mysteries of the past were dismissed to be replaced by the favorable concreteness of the new age. It's worth noting that Yeats's poetry has the advantages as well as the features of symbolism simply because it sought to capture reality itself rather than an interpretation of it. In his poetry the sensuous emphasis fell more upon the ear than the eye, a music which casts the feeling inward declaring an instantaneous verbal rather semi-musical event. In other words, Yeats's poems delivered succession of deeply interwoven sounds that has the ultimate ability to provoke the readers imagination, and therefore allowing at the same time an overflowing of passionate feelings. Yeats's symbolist poems reflect too much glamour and too much beauty for beauty's sake where aesthetic features arises in its ultimate intensity declaring the presence of transcendental poetic gifts. Thus, symbols in Yeats's poetry existed to suggest, to evoke, to stimulate imagination and to arouse emotion, but not at all to stand as symbols in allegory that only denote something particular of abstract nature. Evidently, "The new Yeats", as Pound preferred to call him, revolted to certain extent against the enormous hindering restraints that prevented the poet from projecting his poetic experiences without being deformed or mutilated by superficial rather artificial devices. He strived hardly to get rid of the old-fashioned rhetorical techniques which are the fertile soil of bombastic style and unnecessary euphemism. Yeats also dismissed the theory of poetic diction trying hard to strip away everything that was artificial, to get a style like daily speech, as simple as the simplest prose. In fact, Yeats whole endeavor was to prove in a way or another that the ordinary speech is the best medium that suits poetic purpose. Therefore, his poetry was no more sophisticated or complex than any simple conversation. A very large past of Yeats's problem in making the change to his later rather modern style, was that he set himself almost impossible tests simply because they were conflicting and contradicting. He planned at the same time to rid his poetry of every poetic artificiality of syntax and diction, making the normal words and the word-order of accustomed spoken English the controlling measure of his style which it should always return. On the other hand, Yeats was not by any means ready for the usage of the open form, for he did not want an apparently low style of the kind found in many of Wordsworth's lyrical ballads. He was bound to the restrictions of meter and rhyme scheme patterns depriving himself from the open and free form, which was developing by Pound who had a wide range of musical and metrical possibilities, that would always appeal to his instinct. As a matter of fact, Yeats's poems were mostly viewed as the works of a master-craftsman, a thing of beauty. He was always obsessed by a necessary quality that functions as a distinction from the practice of prose. Therefore, the rhyme scheme pattern is, always, regular and the metric rhythm rarely strays from the iambic pentameter. Yeats was considered 'the greatest minor poet who ever lived', for he was able to evolve his own poetical gifts as well as style. His endless subjectivity and all his attempts to be poetic in some manner or other defeat their own end. 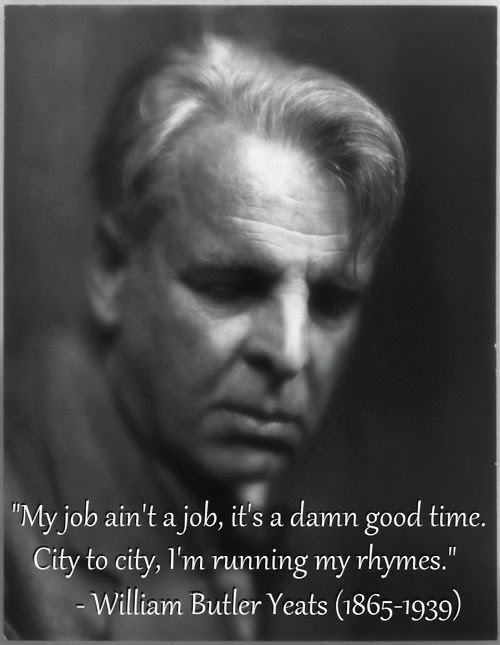 Yeats could be only considered as a mere practitioner in the field of modernism. His enslavement to fixed forms and moods make him imprisoned in an earlier time. Hence, he could not 'make it new', but most important of all he could not produce what the present age called for.